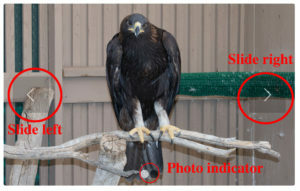 One of the many great opportunities that our new facility provides, besides state of the art rehabilitation, robust education, conservation services, and lessons in sustainability, is a very interesting and greatly needed research project that occurs right smack dab in our 180-foot flight enclosure. The structure itself is just cool. It has length (180 feet), a bend to allow for flight banking maneuvers, a pond for stocking with fish if necessary and several samples of utility equipment set up to mock actual poles. Two other poles are simulated distribution poles, which are the most common poles used by large birds (mainly raptors) for perching and nest building. 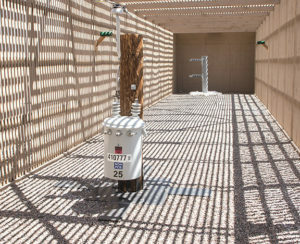 This scrutiny of mock-up poles will allow SRP to use new raptor guards made specifically to cover some of the components to keep birds safe, and to re-evaluate the interaction of those covers and the birds. 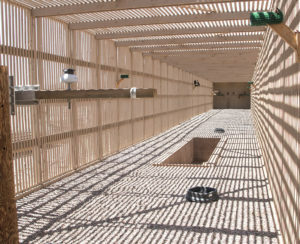 This study is aided by the installation of cameras, which allow the birds to be watched as they land on all of the structures. Furthermore, Liberty Wildlife will eventually be able to live stream video with the public using these cameras in the future. 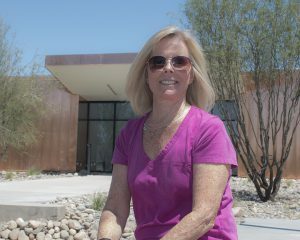 SRP has been active in protecting birds since the creation of their Avian Protection Program since the 1990’s. 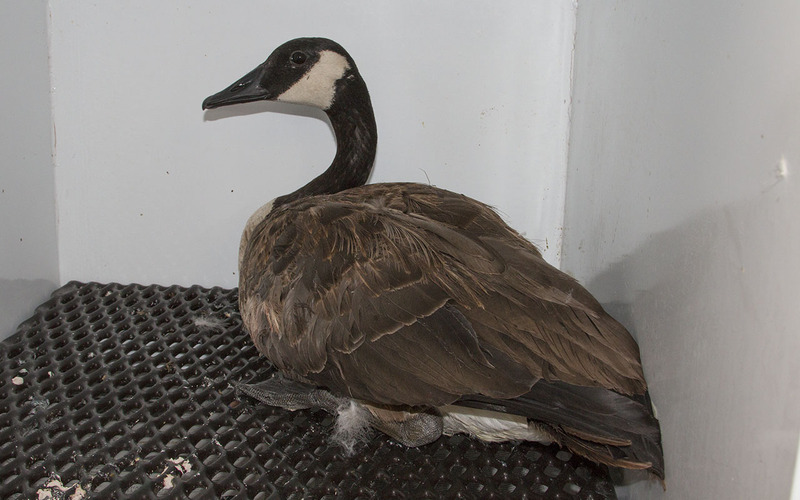 They have been active in implementing a variety of avian protection standards based on the recommendations and guideline suggested by the Avian Power Line Interaction Committee. 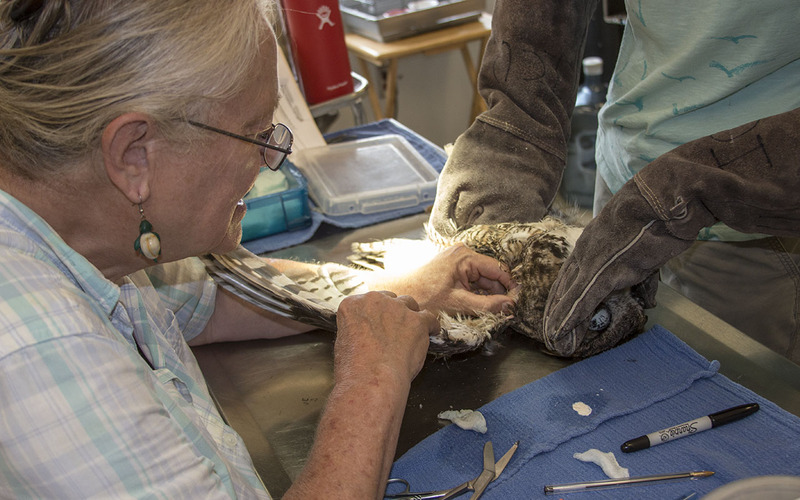 These guidelines and SRP’s use of them have been designed to limit and hopefully eliminate the likelihood of avian death and injuries. We are grateful for this partnership and for the opportunity to be a part of a solution to the problems of negative interactions between power distribution and wildlife. The intake total for the year is now up to 6764. The monsoon is back and with it the intake rate, which had dropped to a low level of activity, has crept up again. About a week ago we took in number 6453 for this year which equaled the total figure for all of last year. We figured that this year would be a little slower due to the move, but it hasn’t work out that way. In any event we built this new state-of-the-art facility so we could do more of what we do, so it’s all going down the way it was meant to. 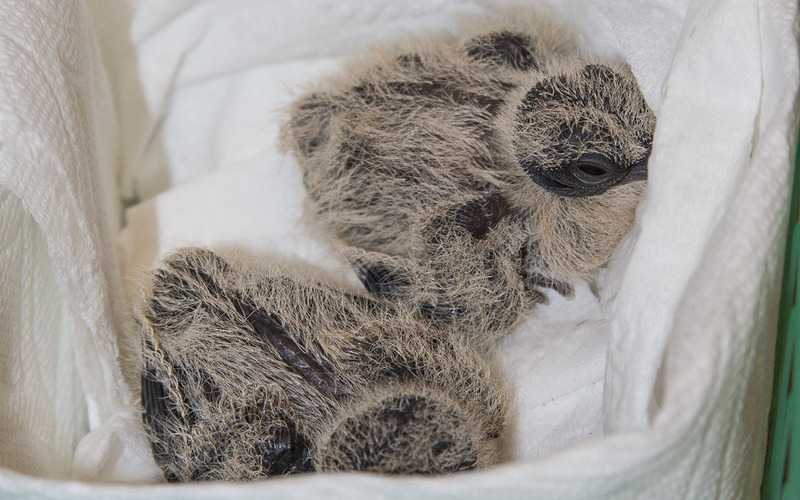 We are seeing more species and more individuals than ever before, and we are providing medical and rehabilitative care for any wild creature that shows up at our door. Would we have it any other way? Absolutely not! 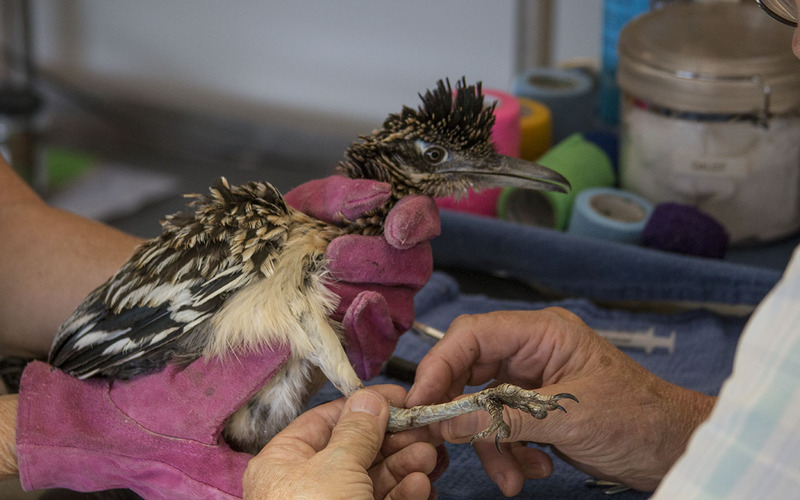 Some of the many birds treated in the last two weeks by the Medical Services team include this roadrunner with a fractured leg, a great horned owl with a electrical burns, and a gila woodpecker with wing issues. Not all patients survive their injuries, but everyone receives the same dedicated care and treatment from the trained staff and volunteers. Do we only save birds? Of course not! 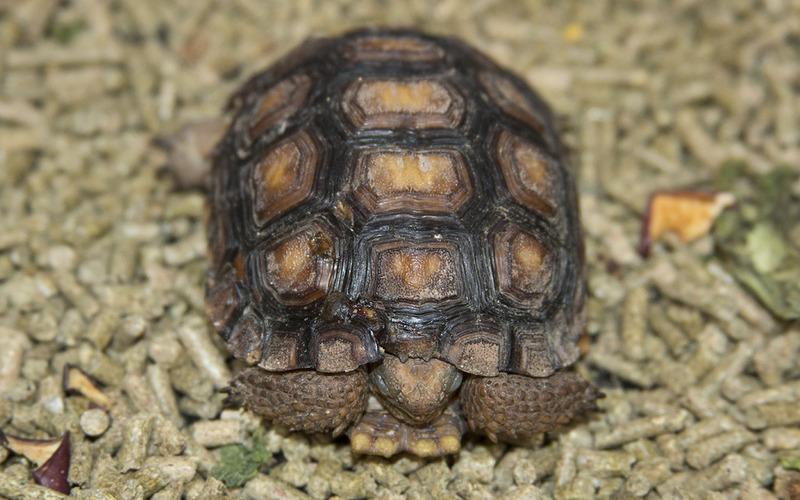 The small desert tortoise was brought in after he was mistaken for a chew toy by a dog (not the first time we’ve seen this happen!) Luckily the damage was not too severe and his prognosis is good. 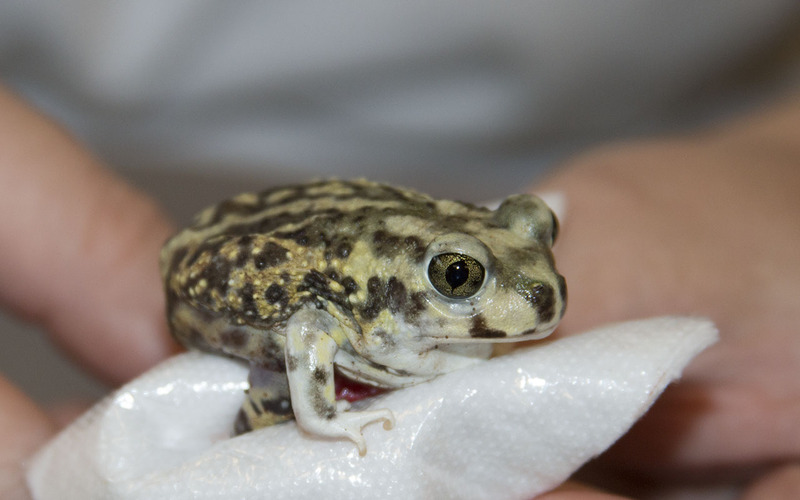 The other little guy is a Couch’s spadefoot toad that was brought to the intake window after nearly being run over by a car. Having had one of his feet amputated, the little amphibian is gamely hanging on despite the extent of his injury. The last photo (photo by Jesse Brown) is of a small possum that is currently in our care. 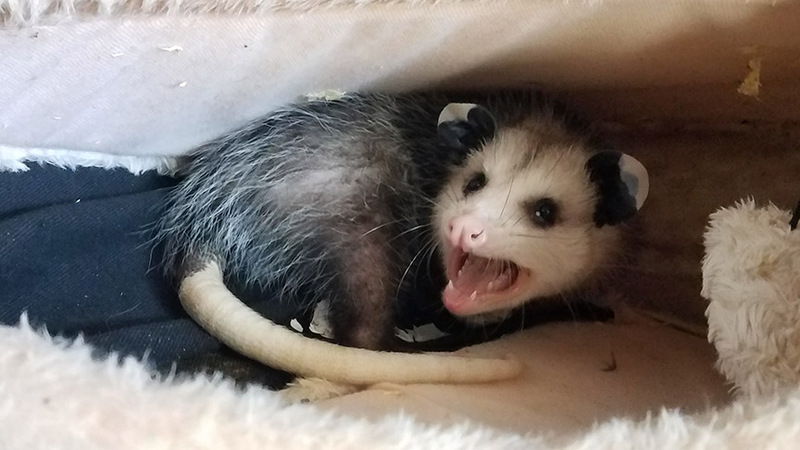 This type of possum is not native to Arizona and was brought to us by someone who said they got it from someone else who had the animal for approximately 3 weeks in an attempt to make it a pet. After that time, they decided it was “too mean” to be a pet (aggressive?) and wanted to get rid of it. 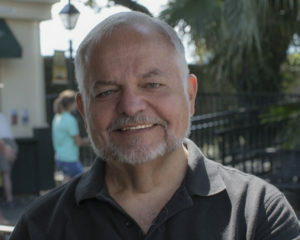 Again, wild animals are best left as wild animals and attempts to domesticate them are most likely to fail, not to the betterment of the animal. All shapes and sizes of birds arrive at all times of the year. 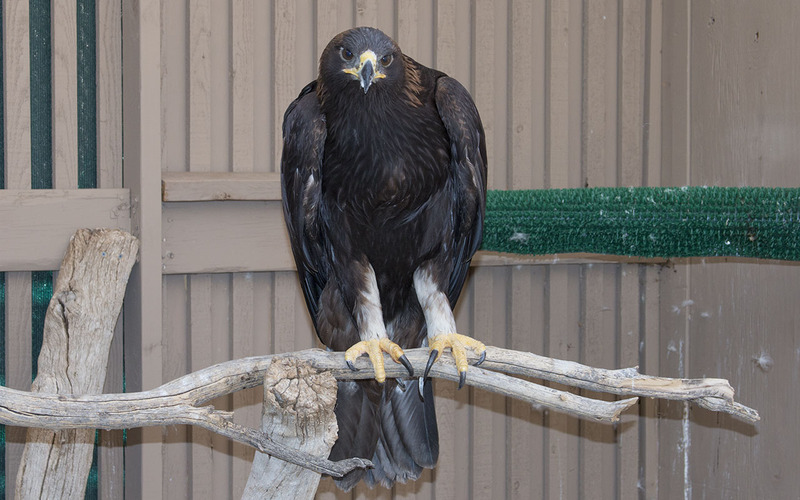 Recently we took in another golden eagle from a facility in the northern end of the state. 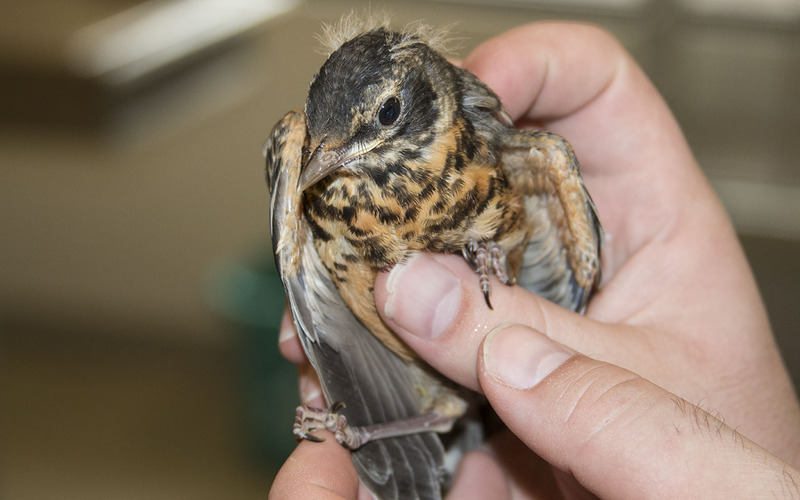 The young bird is reasonably healthy but is under close observation to determine what treatment he might require. Then, on the rare side of the coin, a baby robin came to the window from the south side of Tempe. We don’t get to see many robins, especially nestlings or fledglings as robins primarily nest in cooler climates back east. 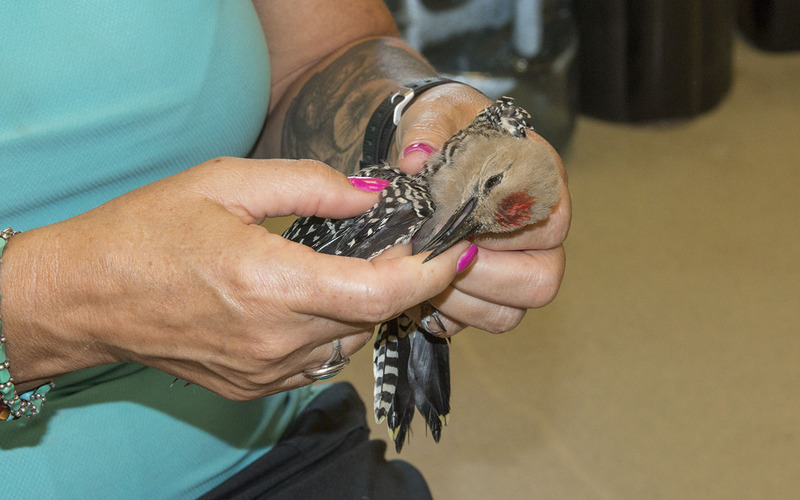 In any case, the bird is doing well and is getting special attention from the OC staff as a visitor of note! We have taken in several bats of late, probably due to the same factors of heat and monsoon activity that precipitates an influx of other Arizona natives. 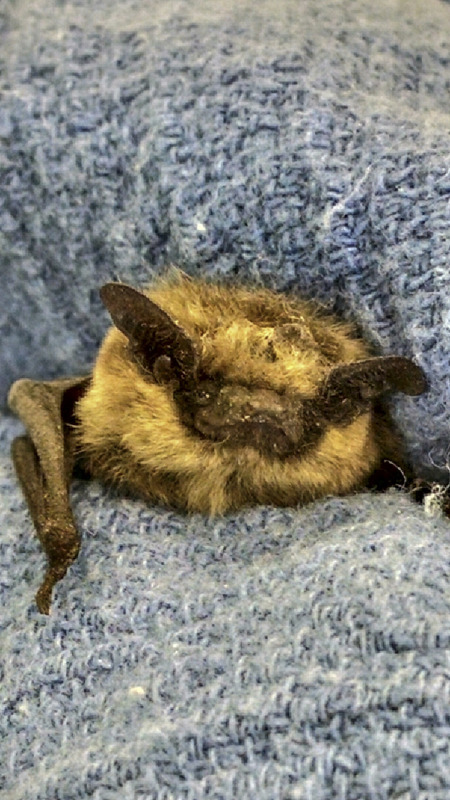 There are about 28 species of bats in Arizona and nearly all of them are important pollinators. 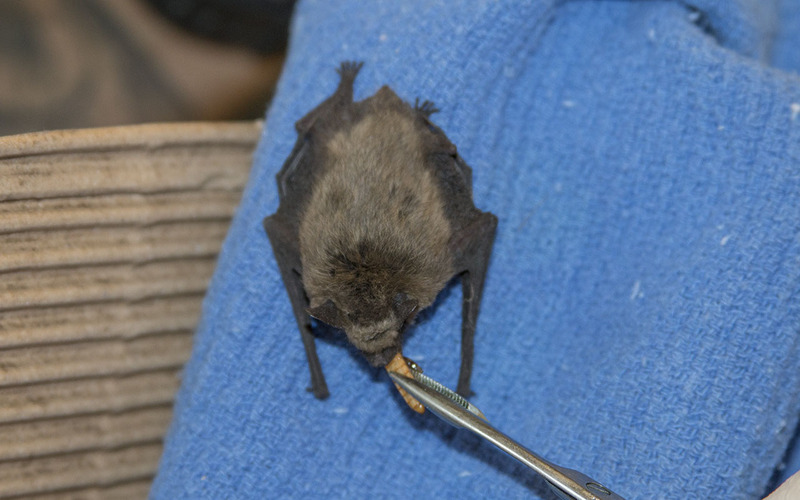 We currently have the mammal room set up to accommodate a number of bat enclosures (closely resembling tiny tents) and as out experience grows, we hope to be able to continue to be a resource for bat rehabilitation in the state. You can click on either carat to slide the picture left or right to see more images. Thank you again for the Archives……..